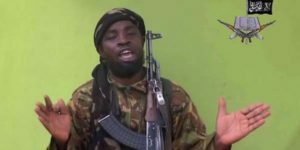 Abubakar Shekau, the leader of the Nigerian jihadist group Boko Haram on Sunday night, reacted to the election of Donald Trump. “We’re done with Obama, now we’re going to start with Trump […] we remain convinced by our faith and we will not stop. For us, the war is just beginning,” he said in the Hausa language. Boko Haram, which has killed and kidnapped thousands of people, is waging a seven-year-old uprising against the Nigerian state. The group an area in north-eastern Nigeria by last year but has since lost significant ground amid growing regional military pressure. Hundreds of fighters and their families have surrendered in Chad in the past month, security and U.N. sources said on Monday. As a reminder, the terrorist group, which pledged allegiance to ISIS in March 2015, aims to impose a stricter enforcement of Sharia law across Africa’s most populous nation, which has a Christian-majority south and a Muslim-majority north. Posted by Steven Addamah on November 14, 2016. Filed under Zoom. You can follow any responses to this entry through the RSS 2.0. You can skip to the end and leave a response. Pinging is currently not allowed.